Easy signage for stores, trade shows, churches, and more. 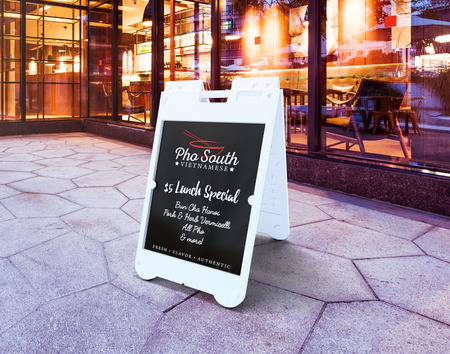 Plastic A-frame sign printing is an excellent way for businesses and churches to spread their message on the sidewalk or indoors.These plastic A-frame signs are lightweight but sturdy, removing the weight of traditional wood and metal signs without sacrificing quality. Plastic signs can be replaced quickly, with no special tools necessary. They are handy for messages that are updated often a great choice for signs that need to be stored or moved frequently. To make sure your sign’s artwork prints correctly, use our layout templates for the right specifications. Just download the file in the format you need. It will help set up your file for the best possible results. Whether you need portable roadworthy signs for dominating the trade show circuit or simply need an economical, high-quality solution for displaying information at your store, corrugated plastic signs have plenty to offer. They make a great choice for churches, events organizers, and restaurants that need to be able to update their signs as their needs change. Try plastic A-frame sign printing today.